If it was action you were hoping for from the seed market last quarter, you’d be better served watching the first two episodes of Silicon Valley, Season 2. Pizza anyone? 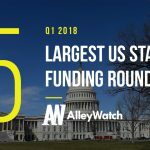 As for our own startup news, New York City saw a total of 25 seed deals completed in Q1 – just shy of last quarter’s 26 – and a total of $39.2 million in funding, which was down 26% from Q4. Compared to this time last year, Q1 saw 29% fewer deals and 32% less in total funding. Suppressed deal count is not surprising at this point. We and others have written plenty about the recent trend of fewer deals commanding larger price tags – both in New York City and around the country, where angel and seed deals have dropped nearly 50% from the number of individual financings seen in 2014. Still, capital is flowing freely to the best opportunities, especially in our city. We continue to witness high levels of invested capital, as evidenced by steadily rising average deal size over the course of the last seven years. This is a trend that we expect to persist for the foreseeable future, given an increased supply of seed capital (ahem, Sequoia, SoftBank) chasing the best deals in the city and growing numbers of high-quality, experienced founders who are able to command larger rounds. It’s notable, then, that as of this first wave of publicly available data for Q1, the median seed check came in at $1.57 million, down over 20% from last quarter, and down 8% from this time last year. This is the lowest average deal size since Q1 2016, and the first time since Q4 2016 that average check size has decreased from the prior quarter. New consumer marketplaces – especially those that cater to very niche markets – continue to emerge, drawing from the success of Craigslist and other incumbents. Q1 saw funding go to marketplaces for furniture (Furnishare), employment (Hyr), travel (ViaHero) and even long-tail categories like boat rental (Sailo).